Welcome to the ridiculously late review of last week's 205 Live episode. My apologies, I've been busy with some time away. I did catch the show on time, though, if that counts for anything. Right, so on to it: this episode—the first in 205 Live's brand-new timeslot in WWE's three-hour Wednesday nights right before NXT and the Mae Young Classic—proves that when it absolutely has to, the show can hunker down and get to business. Sure, it's not exactly live anymore, but with a solid two-match episode, 205 reestablishes itself as one of the premier hours of main roster wrestling. Like I always say, the show works best when it bucks the formula and presents wrestling at its finest. No time and place for a squash? Best to not have one and focus on two barn-burners instead. I appreciated finally going into a new story for both TJP and the Lucha House Party, two entities who have ties to lucha libre. Then we've got the Cruiserweight Championship main event, which they decided to give some New Japan/PPV time to. Even though Gulak didn't win, as predicted, and even though Buddy Murphy was once again almost treated like an afterthought, they were able to honor him and the title with a match like this. Cedric continues to look like a dominant champion with no real end in sight, so it's up to them to spend the next couple of episodes building up Murphy if he's winning in Melbourne. If we're judging everything by this first episode on Wednesday nights, then the move feels like a soft reboot for 205 Live. I'm not too sure about the details, but they seem to have gone back to taping the show before SmackDown in the wake of the Mixed Match Challenge and the crowd sounds livelier. But I know better; I'll have to wait for how they do this week's episode before declaring the reset. Still, though, catch this episode. 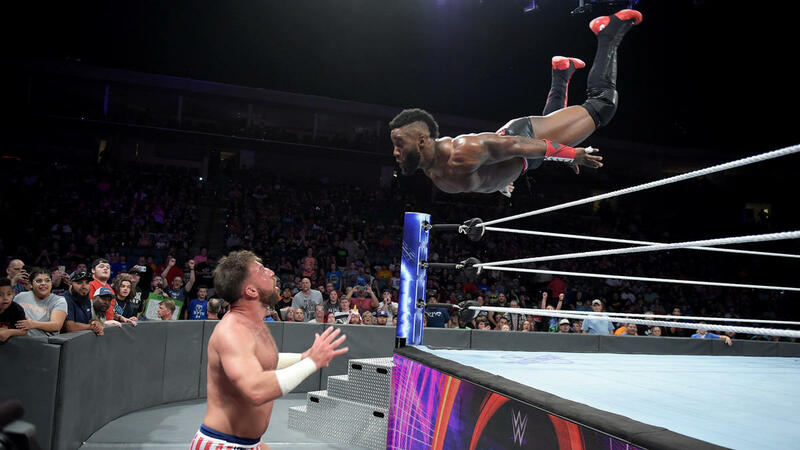 205 Live 9/19/18 Grade: The show makes a huge splash in its first Wednesday night episode, and they knew exactly what they were doing to make sure it was a good one. It gets an A. Really intrigued at this new TJP/Lucha House Party feud. Being a former luchador himself, TJP knows exactly how sacred a mask is, so I want to see if he's going to turn his back on his heritage and address his former characters somehow. For those who don't know, ever since he became the freely-unmasking Manik he's changed his stance on how masked wrestlers could operate, comparing himself to the MCU versions of Iron Man and Captain America whose identities the public knows. Let's see if he brings this philosophy to the show. Drake brought back the orange suit and I am glad. I'm pretty happy the show is really actively addressing Lio Rush and Drake Maverick's involvement on RAW. I feel like it's some low-key complaining on how stupid the whole thing seems to be on its face. So we're really just bringing Mustafa Ali back with zero struggle in his injury storyline? How do you wait until like 15 minutes into the match before showing Buddy Murphy watching backstage? At least they didn't forget to interview him after the match. Cedric Alexander (#3 last week) — Cedric reestablishes himself at the top like he always does, but will his time as champ come to an end in Melbourne? Drew Gulak (#1 last week) — Gulak brought the fight, but it wasn't enough. I wonder how he can rebound from this. Buddy Murphy (#2 last week) — Murphy sits back down at the #3 spot but only because he wasn't booked for a tune-up. He's waiting in the wings, though, and expect him to go up this week. Mustafa Ali (#5 last week) — Ali jumps up one spot after getting officially cleared to compete on 205 Live again. Lio Rush (#4 last week) — The 23 Year Old Piece of Gold is everywhere and nowhere at the same time. That's actually possible. TJP (new) — TJP rebounds from oblivion after a huge win on the show. It's against Lince Dorado and it's because he pulled his mask off, but way to make a statement. Hideo Itami (#6 last week) — Itami gets his rematch this week but no sight of him last week. Noam Dar (new) — Not on the show this episode but his rematch with Lio for this week is also official. Lucha House Party (#8 last week) — The Party have found themselves a new enemy, but had to lose in the process. Akira Tozawa (#9 last week) — No sign of Tozawa this episode.